will discuss temperature and water. As you know, the most important thing when considering plant growth is understanding limiting factors. Plant growth is determined by limiting factors. if your plants do not receive enough of any one (1) factor they won’t grow at the maximum rate no matter how much of any other factor you give your plants. To be a better grower find your limiting factor. Assuming you have a great light from HTG Supply, the next limiting factor is water. lost to the atmosphere by pores in the leaves called stomata. Other than photosynthesis water is needed to transport materials through out the plant, like blood in humans. Moreover, water comprises a significant portion of the inside of plant cells. It is water pressure inside cells, termed turgor pressure that holds plant leaves erect. If plants have too little water, their leaves wilt as individual cells in the leaves shrivel and shrink due to lack of water. Another use of water for indoor growers is to mist their plants to wash off dust. You simply spray a mist and let the water build up and run off the leaves, the water will carry the dust away. Small gardens can use a hand mister and larger application automatic misters are available. Be sure not to get the HID light bulb or the ballast etc. wet, ever! (High Intensity Discharge (H.I.D.) bulbs like metal halide and high pressure sodium get very hot when operating and a single drop of water can cause them to burst. Ballasts are an electrical appliance and it’s just common sense not to get it wet.) You can even add diluted fertilizer or special foliar feeding products to the water you mist the plants with and it will get into the leaves. Check out the very popular Spray-N-Grow line of foliar sprays and Stump Tea Compost Tea Mix for great foliar feeding products. You should mist your plants at the beginning of the “lights on cycle” so they have time to dry under the lights. Plants can be attacked by fungus if their leaves are wet. If you don’t have a carbon filter in your greenhouse to cut down on fungus and bacteria, you might want to mist your plants less often, once a month is enough. Stop misting the second you see any fungus on the leaves (white, gray or black powdery substance). area, you probably should not mist your plants often. Water stress due to too much or too little water in the grow medium causes the stomata to close. As you know from last month, it is the stomata that also allow CO2 into the plant. Closed stomata mean no intake of CO2, so no photosynthesis and little to no growth until the stomata open again. One of the biggest problems people have with plants in soil is that they give the plants too much water. You should visibly see that the soil or grow medium at the top of the container is dry before watering you plants again. I like to physically pick the plant up (by the pot) to tell if it is heavy (wet) or light (dry) and add water as necessary. When you do water your plants, you want to make sure the entire medium is saturated with water. If part of the soil gets too dry the roots in that area will die. To make sure all the growth medium is wet always water until you see water running out the bottom. (Always use a container to catch the water overflow). Plants can sit in water for a few hours to a day, but if the container you are using to catch the water still has water after 24 hrs, you should dump it out. For most plants the soil should be damp but never soggy. A good rule of thumb is to let 10% of the water drain out of the bottom of the pot to ensure it is saturated and also to leach out some built-up nutrients. There are several devices on the market to tell you the amount of water in the soil, including moisture meters and the like. However, your hands can be used to measure soil water content. If the soil is dusty it is time to water. If it feels damp, good, if you can squeeze water out of the soil, you need more drainage and/or you are over watering the plants. Like I said above, I also like to pick up the container to really tell if the plants need watered. Of course, drooping leaves and a dry soil mean you should have watered yesterday, but alas it may not be too late. Just water as directed and you may see you plant spring back to life – and keep a better eye on them in the future! As mentioned a good rule of thumb is that soil and soilless mixes should be watered only after the top layer is dry. Grow Room Automation can take the thinking out of water timmings and provide data logging for later refference. With good drainage, (high amounts of perlite or sand for example) over watering may not be such a problem. If you use sand to increase drainage, know that some types have limestone which may affect your pH, so be careful. Indoor potting soilsusually are fine for growing plants. I often add several soil supplements to store bought potting soil such as play sand, perlite, vermiculite or autoclaved compost in my greenhouse to increase drainage. (When using perlite, always wet the bag contents down with a lot of water BEFORE using it so there is no dust, the dust is harmful to your lungs). Adding any of the above supplements will also make it easier for roots to grow through the soil. The less energy the roots spend on pushing through the medium the more energy the plant can spend on vegetative growth and flowering. The take home message: You need to make sure that the containers you use have good drainage. Many Hydroponic systems like Deep Water Culture and Nutrient Film Technique (NFT) systems, always keep the plant’s roots in water. Other Hydroponic systems like Ebb and Flow (aka. Flood and Drain), Drip Systems and Aeroponics utilize water in different manners than soil or soilless grown plants. (Look for future articles on hydroponics). The difference between hydroponics and soil or soilless container growing is that in a hydroponic system the water is aerated (has oxygen in it) so that the roots do not rot. The aeration of the water is accomplished by moving, mixing and cycling the water. A principal idea for growing via hydroponics is that plants will have greater growth rates since they only need a smaller root system since the roots always have water and nutrients and don’t need to grow “in search” of nutrients and water. Also, hydrponic nutrients are readily available for plants to use and do not need broken down into usable forms like organic, soil grown plants roots must do. This saves the plants a tremendous amount of energy which they instead use for growing the vegetative parts of the plant. Hydroponics growers also have the potential for greater control of nutrients available to the plant. medium is Expanded Clay Pellets (a.k.a. Hydroton) it absorbs water to keep roots moist between watering and also allows good aeration (oxygen) for the root system. Expanded Clay pellets are usually used in medium to large sized net pots and they anchor plant roots and support the plant very well. moisture/air ratio for optimum root growth and comes in 3’ slabs or 3″-6″ cubes that allow for a strong root system to develop and anchor the plants. Some hydroponic systems use very little to no grow medium, such as NFT and Aeroponic systems, and the grow medium they do use is mostly for nominal support of the plant. Each grower must find for their type of plants the balance between the two functions of roots taking in water/nutrients and supporting the plants. Few plant species will grow well in all types of hydroponics or growth medium. No matter the grow medium, gardeners who want to take things to the next level can invest in a Hydroponic Controller to ensure the plants get wattered as they need it. particles. Roots of most land plants will rot and/or be attached by harmful bacteria if there is not a good mix of air in the medium. Growing outdoors you can still add soil supplements to improve drainage. (See soils 5/08 ). The term pH comes from a Latin phrase “pondus Hydrogeni” since it (pH) is an exponential measurement of hydrogen ions. In English, pH is just a measure of acids and bases, with acidity being a measure of high H+ ions and basic substances taking up H+ or having high OH- ions (Alkaline is another term for basic). What you need to know is that the pH scale ranges from 0-14. Zero is the most acidic and 14 the most basic. You need to know the pH of your growth medium because most plant nutrients are available to plants in a limited range pH. In other words, if the pH of the soil gets too high or low growth will be limited. Stunted growth is evident in plants growing in overly acidic or basic environments. Hydroponics growers need to test the water (nutrient solution in the reservoir) regularly since there are no natural pH buffers like in soil and the pH can change rapidly. Test your water everyday until you get a pattern with your plants growth cycle. There are chemical and organic pH adjustors to adjust the pH of the water in hydroponic systems and all work very well. container for a day and much of the chlorine will diffuse (evaporate) out. degrees causes tissue damage in most plants, and optimal photosynthesis is not possible for most plants below 60 degrees or above 90 degrees F. You should try to maintain temperatures in your grow area so that the temperature never goes below 60 or above 90 degrees F.
using a basement as your grow area. Cement lined floors radiate cold. If the roots get cold, plant growth will be slowed. To prevent this, keep your pots off the concrete with Styrofoam insulation or wood pallets. It is a very good idea to use the Thermometer Hygrometer by Grow Bright. I place the remote probe on the ground next to the pots, and the console is close to where the plants are. The probe does not detect humidity but humidity is not really important around the base of your pots. With this set up you will know if your roots are warm, and will be able to detect the opposite problem on the top of the plants. I say opposite problem, because while roots can be too cold on a cement floor, a sunlight room or one lit with HID lights can generate a lot of heat. 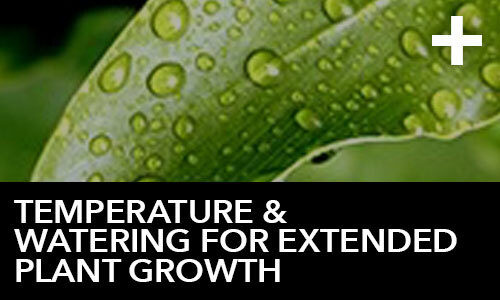 Too much heat will slow down plant growth rates as well. You can ventilate the room but if you ventilate air outdoors or pull air in from the outdoors you risk pests getting in your garden. I “scrub” my air using a carbon filter (PureFlow 6 jr.) in order to circulate air in my grow area. The filter is three feet off the ground to maximize airflow into it and I have flexible duct exhausting right at the grow light and across the plant tops. This set up helps to move the warm air away from the plants. This set up only works if you have a large grow area where some of the area is not heated by the light. A small grow area will just get hot throughout without an outlet for the heat. If you are using a greenhouse or other mostly sunlit room, white opaque paint can cut down on the light and heat entering the room. fungal spores, so keep the area clean. plants, the water running through the hose was very cold, nearly 50 F. We had to rig up special piping to get warm water into all the rooms, but the plants thrived after that with their warm cozy waterings. Outdoor Temperatures: Other than measuring outdoor temperature with a thermometer and degree F or C, we can think about outdoor temperature several ways. One outdoor temperature that you hear is mean annual temperature, which is a poor measure; Anchorage Alaska and St Louis MO have about the same mean annual temp. You should consider the average high and low temperatures for the growing season, the daily mean summer temperature etc. when deciding what varieties to grow outdoors. Many plants you buy in a store have what hardiness zones they grow in. Hardiness zones have been determined by the USDA (http://www.usna.usda.gov/Hardzone/hrdzon2.html). There is also some basic information on growing at this website provided by your government, the link to the hardiness zone map is on this page too. Outdoor heat sources are solar radiation, locally from microbial activity like in a compost pile, heat from the earths crust in some areas, and heat can be moved by wind or water. This is why west coast climates are more moderate with their warm winds. moisture, dust, pollution etc. there is in the air, the more particles in the air, the less intense the sunlight and the less heating occurs at the ground level. If you are growing in an area with a lot of dust/ pollution you should keep the plants clean. The angle of insulation also determines the heating due to the sun, which is just where the sun is in the sky. The angle of insulation is greater in the summer when the sun is higher in the sky, which is why a sunny day in January, does not feel as warm as in July. This also means greenhouses should increase the supplemental light during winter months. Color is also important when considering outside temperature. A darker colored soil will absorb more heat and be ready for planting sooner than a light colored soil. This is why many outdoor gardeners put black material over their garden areas weeks before planting or sowing seeds in order to warm up the soil, get weed seeds to germinate and suffocate and get the soil food web* going early. temperature loving plant. Furthermore, when you garden outside, look where your garden is. Shade can greatly affect temperature in the beginning and end of the growing season in colder climates / higher altitudes. If you get frosts in your area, notice how the frost stays longer in the shade of trees and structures. Planting in shaded areas can take a week or more off the growing season. humidity. Humidity is an important factor for several reasons. First, humidity directly affects how much water plants will use. Dryer areas (low humidity) will require more watering of the plants. Second, too much humidity can set up your garden for a fungal infection that ruins your plants in a matter of days. This can easily be avioided if one investes in a high quailty grow room controller. having to ventilate the grow area. If you are worried about too much electricity on one breaker, you can use a timer and run the dehumidifier when the lights are off. High humidity may not necessarily harm your plants, but it does increase the likelihood of fungal infections (mold). If you have a small space and the humidity gets high, consider venting the room, or using a dehumidifier. Another reason to consider humidity is that carbon filters do not like humidity, so while using a carbon filter will reduce mold spores pollen etc. in your room/home, it won’t last as long in a humid environment. * The soil food web is the interaction of various bacteria, fungal, as well as larger species like worms, millipedes etc. that breakdown and build various components of the soil that are beneficial to good plant growth.